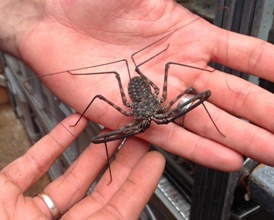 Stratford Butterfly Farm is inviting visitors to come along and get up close to a number of insects including the tailless whip Scorpion Damon diadema this summer! The Scorpion originates from Central Africa where it lives in caves and crevices. However these creatures are completely harmless and have no venomous tail. A whip scorpion was used in the Harry Potter and the Goblet of Fire movie and had the unforgiveable killing curse used on it! The ever-popular Meet the Mini-Beast handling sessions will take place daily from 22 July - 3 September when the Education Team will be inviting visitors to hold a variety of stick insects, African land snails, giant millipedes, hermit crabs and even Madagascan cockroaches! (Please note the whip Scorpion can only be handled by the Education Team as they move very quickly!). In addition visitors can see around 2,000 free flying butterflies within the Flight Area. The Stratford Butterfly Farm works with Butterfly Farmers from all around the tropics on a weekly basis so that they can constantly replenish the Farm with stunning tropical butterflies. There are over 150 different species flying around the Farm from far-flung places as Ecuador, Costa Rica, Suriname, El Salvador, Belize, Kenya, Tanzania, Malaysia, Thailand and the Philippines. Working with tropical butterfly farmers provides an income for the local community and protects the rainforests from being felled. Many of these tropical farms are community or conservation driven projects and help create a sustainable link between conservation and livelihood. By visiting the Butterfly Farm visitors are helping support these projects. Visitors can also discover the fascinating link the Farm has to the rainforests of Belize and the ancient Maya civilisation. The Maya created an incredible civilisation within the rainforest and we have them to thank for discovering chocolate! The replicated artefacts of this civilisation are on display throughout the Farm. Jane Kendrick, Marketing Manager at Stratford Butterfly Farm said "Rain or shine there is something for all the family to enjoy this summer at Stratford Butterfly Farm. Come along and see something spectacular whilst learning something new this summer".